Many older homes in the Houston area have bathrooms with dingy, outdated bathtubs and showers that need replacement, so we offer a variety of tub and shower remodels to bring these spaces into the 21st century. We start by removing your old tub or shower area back to the studs using clean, dust-conscious work practices. We do a complete shower tear-out on every job so we can ensure there are no framing, pest, mold, or plumbing issues before we begin to rebuild with our high-quality materials. Your new tub or shower remodel will be built to your specifications, and can be customized with a variety of tile, stone, and solid surface products for the base and walls – including custom-tiled shower bases which are permanently waterproofed with a Schluter-Kerdi system. No matter what you choose, all of our solutions are leak-free. For tub remodels, you can choose from a variety of high-quality acrylic tubs, cast iron tubs, or even stone-resin tubs, all of which can be paired with any wall surround option. Shower faucet replacement and all necessary plumbing work are included with our tub and shower replacements. For walk in showers and handicapped-accessible showers, we build with an emphasis on safety and accessibility. This often includes widening doors and entry-ways, maintaining low thresholds, adding grab bars, moving or adding plumbing features, and installing shower seats that are convenient to faucet controls, soap niches, and hand rails. We offer a great variety of solutions for senior citizens and mobility-impaired individuals who are looking for a bath or shower remodel. We also receive inquiries from Houston homeowners who are wanting to enlarge and expand their current shower footprint, sometimes by removing an adjacent tub to create one HUGE walk-in shower experience. We LOVE these projects. Other homeowners have “phone booth” or “cave”-type showers which are too small and need to be opened up. For all custom shower remodels, we offer built-from-scratch solutions to enlarge, update, and transform your current problem area into a shower or bath that is AMAZING! For questions about custom projects, call us at 832-464-7251. Building a correctly-waterproofed shower requires training, education, product knowledge, and proper techniques. 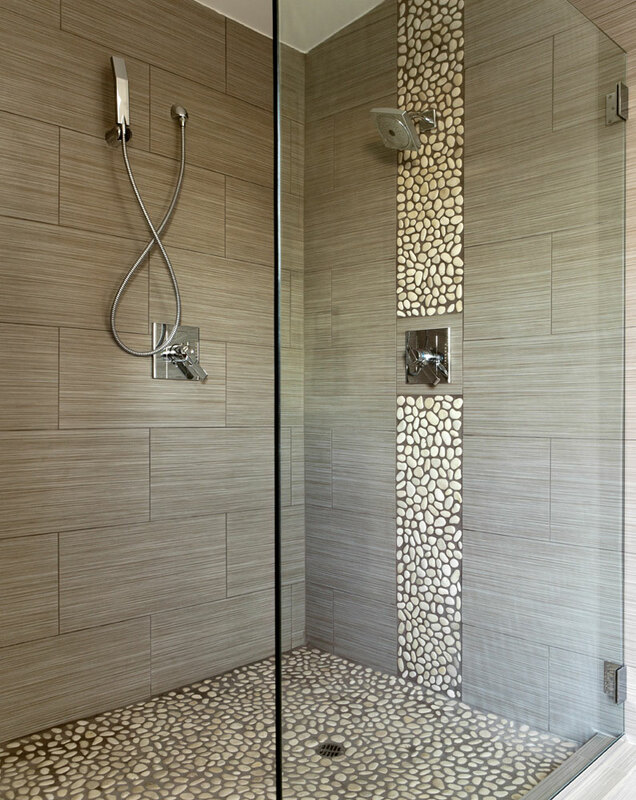 Tile is the “garment” the shower wears; along with thinset and grout, it is not waterproof. Attractive tile work does not ensure that water cannot get behind the tile, and “sealing” the grout similarly does not prevent water from penetrating the system. In order to waterproof a shower, a 100% water-tight system must be constructed behind the tile. Read more on how we waterproof our showers here. Next, no matter how water-tight your shower walls are built, improper or leaky plumbing can cause water damage behind the walls and create major issues. Accordingly, we do not employ apprentices or unlicensed plumbers. All of our plumbing is completed by licensed plumbers, and all plumbing work meets or exceeds current code requirements. Finally, quality detail work means building your new shower to be the best that it can be within the confines of your existing structure. It takes a true craftsman to ensure that your tile, with tiny variations in size and thickness, and all other components, often from different manufacturers, fit together as an integrated whole, especially with wood-framed walls and floors that are almost always out-of-square. Just as poor detail work can ruin an otherwise good-looking shower, sharp details put the finishing touches on a great project and can serve to mask minor structural imperfections. We believe in making the effort that is required to deliver the highest-quality and most attractive tub and shower areas possible. For examples of our work, check out our Photo Gallery.